Sometimes there is just no safe and easy way to get from A to B, and drivers must make the choice either to follow the road of terror or stay where they are. Dave Pankew of Autoblog Canada recently wrote an article called “The Top 5 Worst Roads, Bridges And Tunnels In Canada.” Well what you’ll find here below, are five of the world’s most dangerous roads and the cars we’d want to be in to make it through alive. 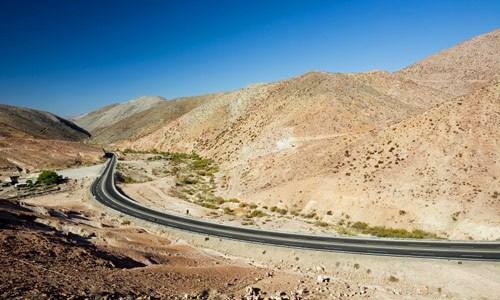 At first glance, the Arica to Iquique Road doesn’t seem that bad – while it is certainly going over some rough terrain, it is well paved and there’s nothing to run in to. Looks can be deceiving, though – it’s a road built through the world’s second most arid place (a snowless region in Antarctica is worse) and the desert is so dry that even fungi and bacteria are scarce. It’s also at a very high altitude, and most engines (and drivers) will fail. The best car for this stretch of road would be a Saab 9-3 Turbo, since it’s good in crashes, and the turbocharger will allow it to function even in low air conditions. Built during the Soviet era to connect Moscow to Yakutsk (coldest place in the northern hemisphere) the Russian Federal Highway is a long and boring dirt road – in winter. Once the summer rains come, it turns into a 1000 mile long ribbon of swamp, getting so deep in some places as to swallow cars whole. 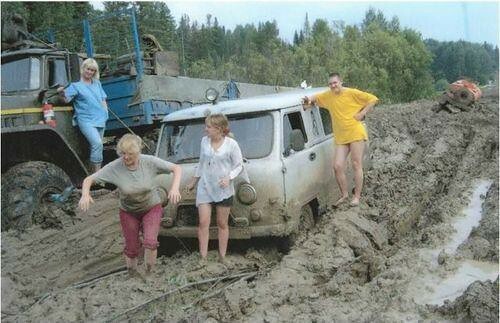 Entire caravans of cars and trucks have been known to disappear in the mud. A reliable and off-road capable Hummer or Jeep would be ideal here, since four wheel drive and ground clearance are musts. 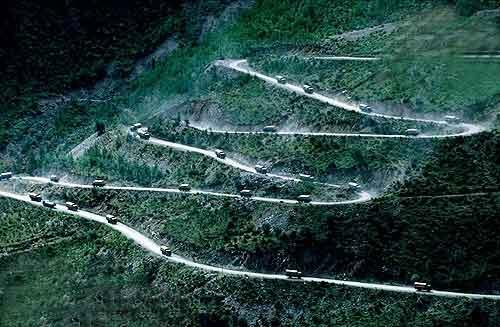 Built to connect Tibet to central China, the Sichuan-Tibet Highway is extremely high altitude, combined with steep cliffs and poor maintenance. Blizzards, snowstorms and avalanches are common, and many drivers plummet to their deaths when they take a turn too fast, or fail to see it coming after dark. This sort of road demands a reliable and safe off-road vehicle like a Land Rover Discovery, but the locals are forced to rely on Soviet hand-me-downs from 30+ years ago. 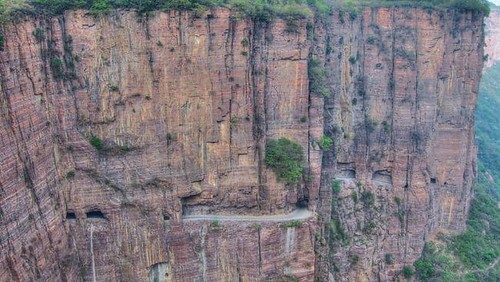 The people of Guoliang China wanted a road – and got one by making it themselves. Literally carved into the mountains by hand, it is notorious for falling rocks and poor construction. Large portions of the road collapse on a regular basis, killing anyone below. A Subaru Impreza would be best here – because the turbocharger and all wheel drive would let you get off the road as fast as possible! 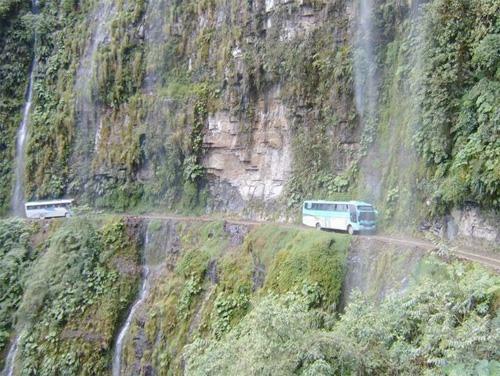 Known as the “Death Road,” this has all the problems of all the above roads combined – mud, poor-quality construction, steep cliffs, blizzards, rain – and bad traffic! The most heavily used road in Bolivia (it is the only one through the Andes) more people die per mile on the Yungas Road than anywhere else. The best vehicle to take here is a plane – skip the road entirely!